First at 34, never too late to start. 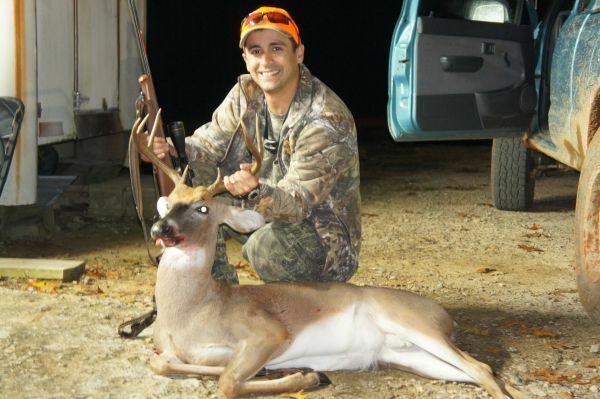 On October 25th I went on my first deer hunting trip at the age of 34. It's never too late to start. The trip to Warren County was compliments of Combat Warriors Inc., an orginization that provides hunting and fishing opportunities for combat veterans and the Embro Hunting CLub. Throughout the morning we hunted with dogs but I didn't have any success. With about an hour and a half of daylight left my guide sent me to a box stand. When I got there, I realized there had been a mistake and the stand was occupied. I decided to go off into the woods well out of range from the stand on my own to try my luck before sunset. After about an hour of sitting on my rump on a small slope in the woods, I heard thrashing in the bushes directly behind me. I slowly turned my head looked over my shoulder and the buck was no more than 20 feet behind me. As I tried to get turned around his head popped up alert and I froze. After going back and forth like this a couple of times, he finally spooked and I couldn't get around fast enough. A few minutes later I heard him circling back towards my location. I walked a few yards to attempt to get a clearer view and there he was. I pulled up and took a shot from standing as he turned broadside to me at about 30 feet. I hit him in the shoulder and after he was cleaned out we saw I took both lungs and nicked his heart. He didn't make it 10 feet before going down and I had my first buck! He isn't the largest but he is mine and the experiecne of having him that close will always stay with me.